A ceremony to honour outstanding groups and individuals of KOVA Prize 2018 in the fields of applied science and technology and social welfare was held in Hanoi on November 24. 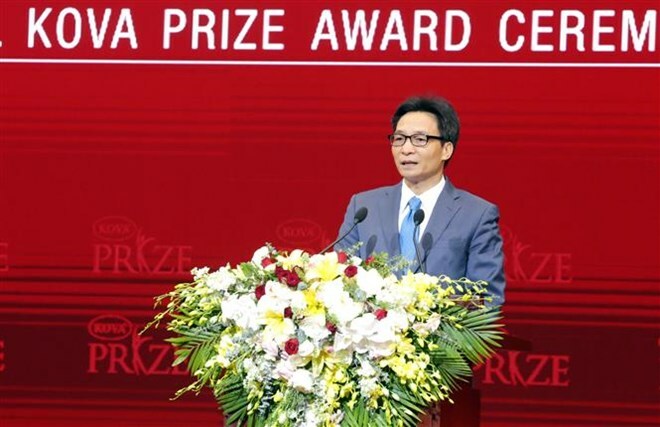 The event was attended by Deputy Prime Minister Vu Duc Dam and former Vice President Nguyen Thi Doan, who is also Chairwoman of KOVA Prize Committee. The 16th KOVA Prize awards include four categories – Innovation, Humanity, Potential and Resilience. In the Innovation category, a prize was awarded to a project finding the cause and restoring normal kidney function for patients with acute kidney failure, conducted by Associate Professor Dr Tran Thi Bich Huong. A research on surgery in treatment of bone cancer developed by Associate Professor Dr Le Chi Dung, and another on safe herbal plant cultivation in Phu Yen province were honoured in the category. Meanwhile, in the Humanity category, the awards were presented to nine groups and individuals for their actions which have contributed to the national building and safeguarding. The prize in the Potential category worth 10 million VND each was awarded to 12 outstanding students with prospects in scientific research, while the Resilience scholarships were handed over to 151 students of 60 public universities across the country. The KOVA Prize, which was set up by former Vice President Nguyen Thi Binh and Associate Professor Dr Nguyen Thi Hoe, Chairwoman of the KOVA Paint Group in 2002, is held annually to honour individuals and groups who have made significant contributions in the fields of science, education, charities, and other areas. Over the past 16 years, the awards have been given to hundreds of groups and individuals, with the youngest winner being 19 and the oldest one 101. The organisation aims to encourage students, individuals and groups – especially those from disadvantaged backgrounds – to pursue innovations in science, technology and social welfare.